Are you knee-deep in planning your holiday marketing campaigns and starting to feel panic set in? I’ve got some great news for you. ShortStack has a handful of readymade templates just made for holiday marketing, and I’m going to share details here about how you could use them to take advantage of this busy time of year. I’ve included more than one idea for each template, so whether you need a Black Friday campaign, ideas for Thanksgiving promotions, or unique Christmas marketing campaign ideas, you’ll find great actionable ideas here. Successful holiday marketing campaigns typically include discounts. That’s one reason I love our Pick Your Discount template, It allows your customers and fans to choose the discount that appeals most to them. Why is this a good strategy? Because $10 off the entire purchase might be great for one customer, but another one is more attracted to a Buy One/Get One offer. You could make this kind of campaign even more enticing by giving people the chance to win one of your products or a shopping spree if they sign up for a discount. Below you’ll find two marketing ideas – one for Black Friday and one for Christmas. Giving people the chance to choose their own discount will make your offer stand out during the noisy Black Friday weekend. 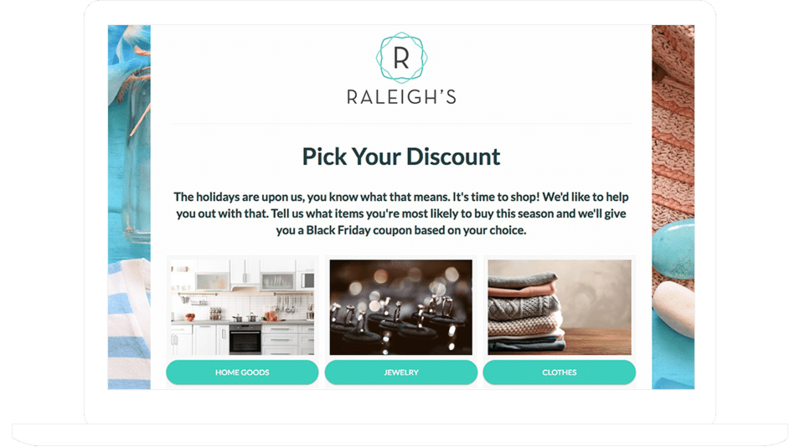 If people have the option to choose the discount that appeals to them, they’re more likely to put your store on their Black Friday shopping route. Bonus: This kind of campaign gives you insight about your promotions. If only a few people opt for your “Buy One/Get One Christmas Ham” deal, but hundreds choose your “20% Off Your Entire Grocery Purchase,” you know what kinds of offers get people through your door. Who doesn’t want to get a gift during the holiday season? Try running an All I Want for Christmas campaign, where people get a discount on a product they really want to receive. Run the campaign for a week or two, and then choose a winner from the people who signed up for a discount. Ideally you’ll choose the winner while your coupon is still valid so everyone who didn’t win will still have time to purchase. TIP: Send an autoresponder email to all entrants after they submit your form with a thank-you message that also includes a coupon to be used later in the holiday season, or sometime in the new year. Food is a major part of most people’s holiday celebrations and traditions. I’m guessing you have at least one favorite recipe you make every Thanksgiving or Christmas. Recipe contests can be great fun during this time of year. How about running a contest where you ask people to share their favorites. You don’t necessarily have to have a food-centric brand, or audience, to run this kind of recipe. After all, everyone loves food! You could feature several different categories, each with its own entry form, where people submit their version of pumpkin dessert, turkey stuffing, or green-bean casserole. Once the recipe-submission period is over, use our Voting Widget to enable voting in each category. TIP: Require folks to submit their name and email address in order to vote. After the contest closes, use our Email Automation feature to announce the winner and send everyone the winning recipes. Cookie swaps are holiday party staples but in this version, the swap is entirely digital. 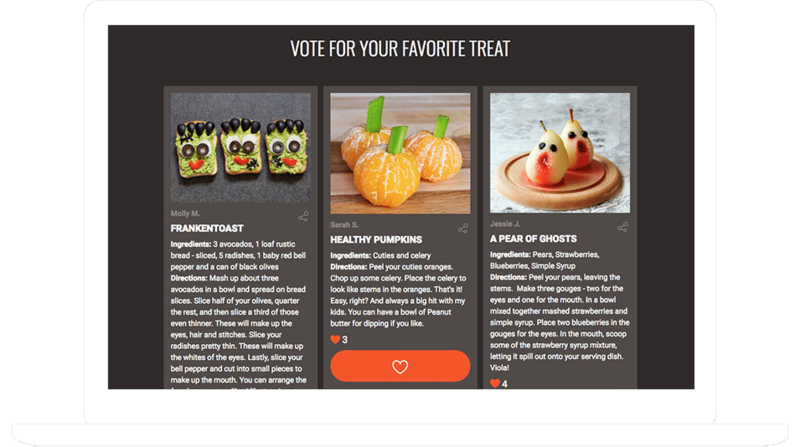 You ask your fans and followers to submit their favorite cookie recipe and then you ask people to vote in their favorites by displaying recipes within the Voting Widget. If you don’t want voting, simply disable voting and allow all entries to be displayed. TIP: If you want people to be able to share the entries they find, enable sharing within the Voting Widget. Instagram hashtag contests are golden these days. One of the reason they’re so popular is because they’re so easy to enter. All people have to do is enter a photo with a hashtag in the caption. When people see their friends’ entries, they click the hashtag and see all the entries associated with it. TIP: When setting up a hashtag contest, include your company’s name in the hashtag. For example, if ShortStack were hosting a Cyber Monday giveaway, the hashtag would look like this: #ShortStackCyberMonday. Black Friday. Just writing the name conjures images of shoppers waiting in line at dawn, the day after Thanksgiving, in order to score the best deals. If you aren’t a retailer, you can still host an online shopping spree. Encourage entrants to post photos along with the hashtag #YOURCOMPANYShoppingSpree to win a prize. In our busy society, it can be easy to forget what’s most important during the holidays. A hashtag contest where people post what they are thankful for has the potential to be both fun and rewarding. Ask people to use the hashtag #YOURCOMPANYThankful to post pictures of what they are thankful for. You could either reward the winner with a prize, or you could make a donation to a charity of the winner’s choice. Don’t make the people who enter your Christmas giveaway decide between giving away their prize or keeping it for themselves. Instead, run a win-win contest where there’s a chance for someone to win two identical prizes — one to give and one to keep! 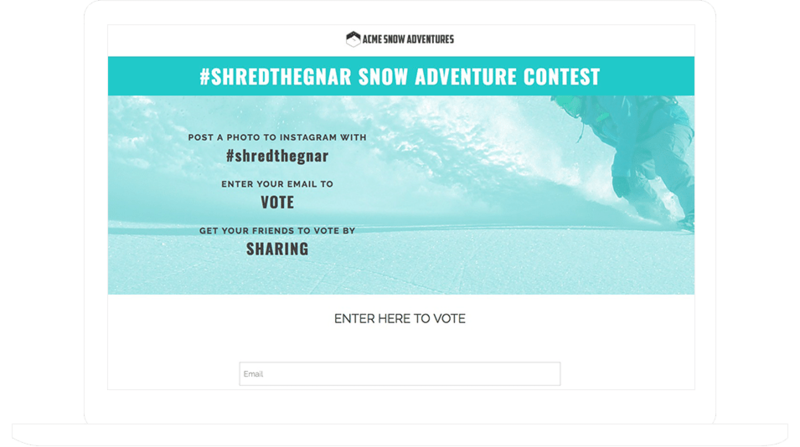 Ask entrants to post photos on Instagram featuring the person they would give the second prize to, along with the hashtag #YOURCOMPANYShareTheLove. The entries you receive will be a gift to YOU! The best holiday social media campaigns keep people coming back day after day. Why? 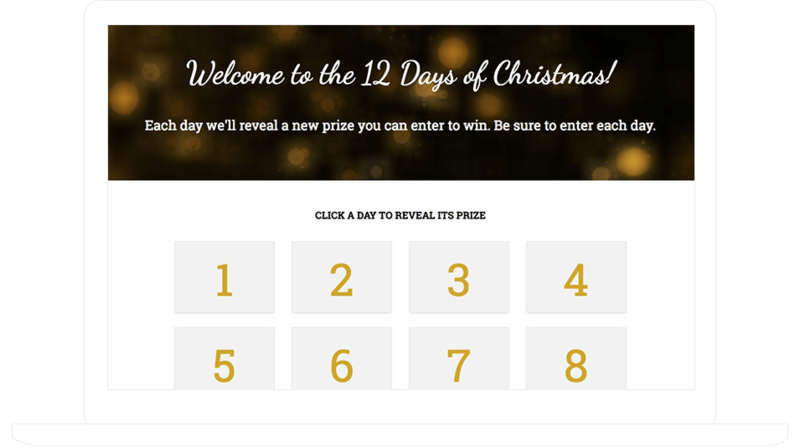 Our Multi-Day Giveaway Calendar template encourages repeat visits because each day, a door is unlocked with a new prize. Visitors can submit their information to win that day’s prize, but they can’t enter all of the days at once. We all know about Black Friday, but what about the additional shopping days that come after it, like Cyber Monday and Super Saturday? Don’t let the fun stop before it’s even December 1! Instead, post a different discount each day for seven days following Black Friday. Give folks just one day to access each deal, but allow them a couple of days to redeem the coupon. Looking to build your email list to use for marketing in the new year? A “Countdown to Christmas” campaign is ideal. Offering a different prize each day, with some urgency to submit entries, may appeal to a wider audience. Remember: if people are returning to your campaign again and again, they are more likely to think of your business when they are out shopping for gifts, or looking for a place to enjoy their evening. 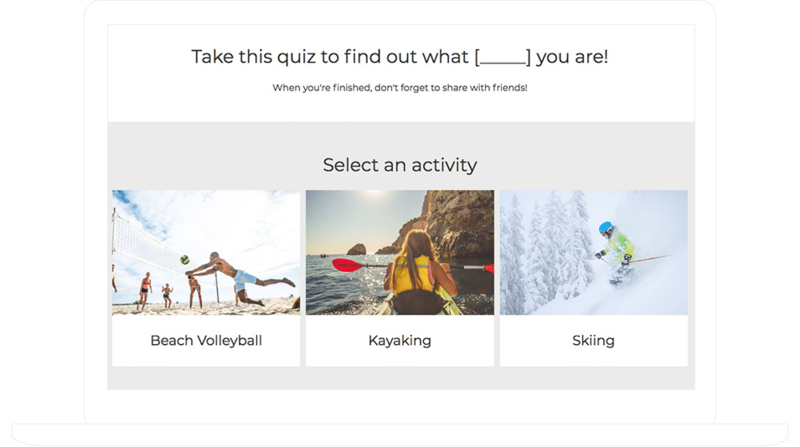 BuzzFeed-style quizzes can be used for so much more than finding out whether you can “Name 50 Countries in 3 Minutes” or “Which Big Bang Theory Character Are You?” They can also be useful for gathering information about your customers and their preferences. Everyone has favorite Thanksgiving recipes, but sometimes it’s fun to try a new dish. But how do you choose one? That’s where a Thanksgiving recipe selector using our Personality Quiz comes into play. Ask your fans questions about their food preferences and other “tastes,” then show them a recipe idea based on their answers. Do you have great holiday gifts on your store shelves? Show off your products with a gift generator! Simply ask the users a few questions about the person they’re buying for, then display the perfect gift based on those answers. A gift generator is a fun way for people to discover gifts they want to give and gifts they want to receive. Suggestion: If you’re asking people to submit their email address as party of the entry process, make sure you do something useful with the information! Start by using our Email Automation features to set up an email to be delivered to everyone who takes your quiz. 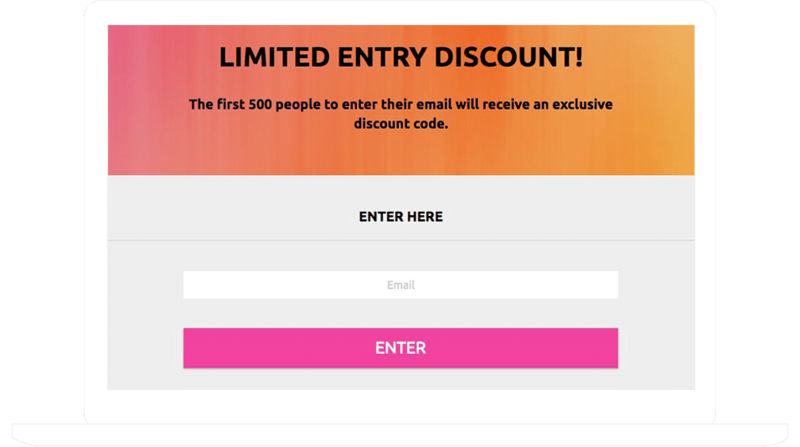 The email could be announcing your next contest or your after-holiday sale. Are you having an open house or other special event during the holiday season? Get a gauge on how many people are planning to attend and build an email list with an RSVP form. Restaurant, club and bar owners know that New Year’s Eve is a big day for business. Create a New Year’s Eve RSVP form with a limited number of spots to help gauge your expected turnout. There you have it! Ideas you can implement starting now, and get a jump on your holiday marketing. Of course if you need other ideas, or help in executing any of the ideas covered here, we’re standing by to help.